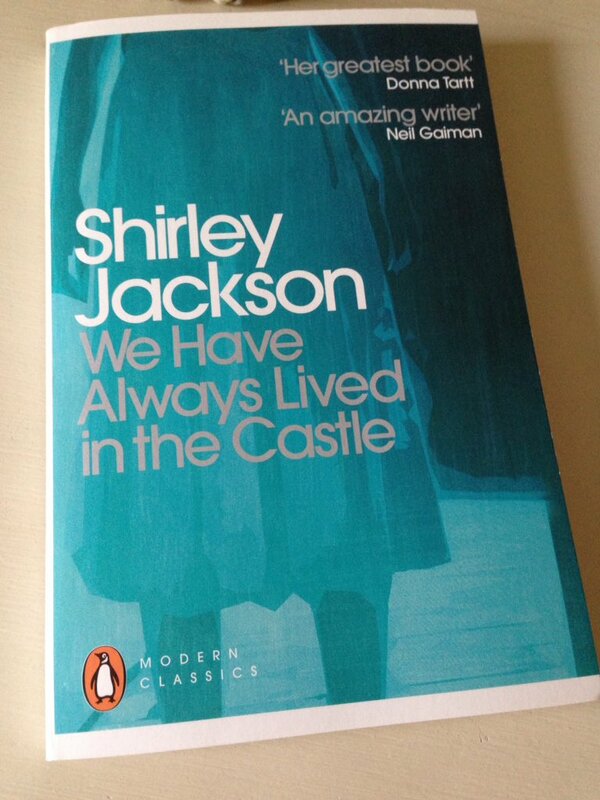 With Halloween fast approaching, I thought it would be a good time to try Shirley Jackson’s widely-acclaimed Gothic classic, We Have Always Lived in the Castle (1962), a book that has been sitting on my shelves for quite a while. Fortunately, it proved to be a highly appropriate read for the season – atmospheric, unsettling and at times quite magical. I think I can see why this book has earned its place in the 20th-century canon. The vast majority of the local townsfolk will have nothing to do with the Blackwoods as a result of an infamous incident that took place at the house some six years earlier. The girls’ parents, aunt and younger brother all died of arsenic poisoning after the deadly substance had been mixed with the sugar they consumed with their blackberries at dinner. Merricat was not present at the time as she had been sent to bed before the meal commenced. To this day the local villagers remain convinced that Constance – then aged twenty-two – administered the poison, even though she was found not guilty of the charge due to a lack of evidence. Constance did not take sugar on her berries that day, a point which counted against her at the time of the trial. As a consequence, the Blackwood girls now live a highly secluded life with their Uncle Julian, the only other survivor of the poisoning. In failing health both mentally and physically, Julian continues to be preoccupied with the murders; as such, he spends much of his time obsessing over his notes on the case in the hope of completing a book on the subject. In order to remain out of public view, Constance prefers to stay within the confines of the Blackwood estate, thereby leaving Merricat in the unenviable position of being the main link between the family and the outside community. Twice a week Merricat ventures into the nearby village to buy groceries and collect books from the library. Here she must run the gauntlet, steeling herself against the taunts, prejudices and slights from the villagers who consider the Blackwood sisters to be nothing less than evil demons. As a character and narrator, Merricat Blackwood is someone you are unlikely to forget in a hurry. There is a childlike quality to her highly distinctive voice; for Merricat, it is as if time has stood still since the poisonings as she speaks and behaves like a young girl, one intent on maintaining the security and stability of her make-believe world. A deeply superstitious individual at heart, Merricat believes she can protect her beloved sister and Uncle Julian from external dangers and evils by relying on magic words, strange rituals and imaginary games. She loves her sister dearly and would like nothing more than to transport Constance and Uncle Julian to the moon – a fantasy world of winged horses, magical plants and eternal sunshine, a place where they could be safe and happy. Constance for her part indulges her younger sister, playing along with her escapist fantasies and dreams to her heart’s content. Nevertheless, Merricat can sense something disturbing in the air – a change is coming and not for the better. The arrival of the girls’ estranged cousin, Charles, seems set to disrupt the comfortable atmosphere in the household, a dynamic that Merricat is determined to preserve. Now that Charles’ father is dead, a man who cut off all relations with the Blackwoods at the time of the trial, Charles is free to reconnect with his relatives. However, he seems more intent on getting his hands on the Blackwoods’ money – the majority of which is locked away in a safe in the house – than demonstrating any genuine interest in the girls’ welfare. Naturally, Merricat sees through the formidable Charles in an instant. In particular, she is dismayed by two things: firstly, Charles’ outright intolerance of Julian whom he considers a burden; and secondly, his developing friendship with Constance who, on account of her sweet nature, can only see her cousin in a positive light. Merricat makes no secret of her hostility towards Charles, a point he intuits immediately. If only Charles would go away, then everything would be alright again and the family would be safe. While this is a slim book, it has much to say about our suspicions, our prejudices and, perhaps most importantly of all, our treatment of people who seem strange or different from ourselves. From what I can glean about Jackson and her fiction, it would appear that this theme of being the outsider – or society’s mistreatment of the outsider – is a feature in much of her work. The plot works very well within the framework established by the set-up. For example, we do learn the truth about the fateful poisonings, but that’s not the main point here. What really sets this novel apart from so many others is its highly distinctive style, much of which stems from the curious nature of Merricat’s voice. Childlike chants and rhymes are repeated at various points in the story, an effect that adds a strange lyrical quality to the text, albeit a rather unsettling one. While I was expecting this to be a somewhat unnerving or chilling read (there are times when Merricat is quite disturbing), I wasn’t prepared for the dark humour, a tone that Jackson uses to great effect in certain scenes. Most of these comic moments revolve around Uncle Julian, whose ramblings about the past provide much amusement for the reader. At an early stage in the story, he puts on a great show for Mrs Wright, a rather timid but nosy woman who is fascinated by the mystery of the Blackwood poisonings. Mrs Wright has come to the Blackwoods’ house to accompany her friend, Helen Clarke, one of the few locals who will have anything to do with the Blackwood sisters. In calling on the Blackwoods on a weekly basis, Helen hopes to encourage Constance to reconnect with society, to begin to live her life again. Much to Helen’s disapproval, Mrs Wright gets swept up by Uncle Julian as he proceeds to show her the dining room where the infamous poisonings occurred. It’s a marvellous scene, too long to quote here. Instead, I’ll finish with a short passage on the ladies’ arrival at the house, one that hints at Jackson’s eye for a humorous incident. We Have Always Lived in the Castle is published by Penguin Books; personal copy. This entry was posted in Book Reviews, Jackson Shirley and tagged #ReadWomen, Book Review, Classics Club, Fiction, Gothic, Novella, Penguin Books, Penguin Modern Classics, Shirley Jackson, US on October 24, 2017 by JacquiWine. The Japanese writer Yasunari Kawabata is perhaps best known for Snow Country, the story of a doomed love affair between a wealthy city-based man and an innocent young geisha who lives in a remote area by the mountains. It is a work of great poetic beauty and subtlety – and yet there is something strange and elusive about this novella, a quality that makes it hard to pin down. 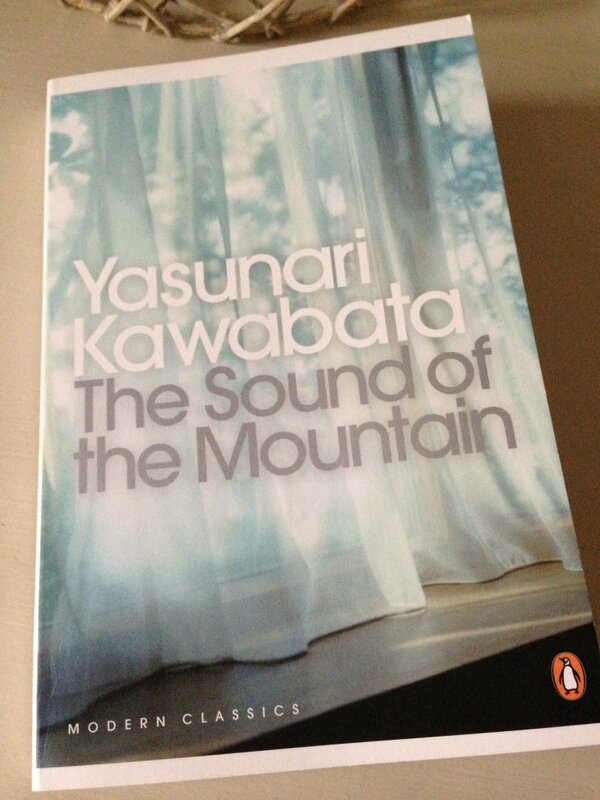 The same could be said of The Sound of the Mountain, written in the early fifties and translated into English in 1970. Once again, I find myself being drawn into a world that feels so different from my own, delicately conveyed like the brushstrokes of a watercolour painting. The novel focuses on Ogata Shingo, a sixty-two-year old man who lives with his wife, Yasuko, in the city of Kamakura, just south of Tokyo. After thirty years, any feelings of love or passion have long since disappeared from the couple’s marriage, leaving Shingo preoccupied with a number of things – mostly concerns about his family, the inexorable march of time and his failing memory. There is a sense that life is gradually slipping away from Shingo; the world around him is changing and not necessarily for the better. In this scene, he has just been struggling to do up his tie. Why should he suddenly this morning have forgotten a process he had repeated every morning through the forty years of his office career? His hands should have moved automatically. He should have been able to tie his tie without even thinking. Shingo is at an age where several of his contemporaries are succumbing to various illnesses, some of which end in death – a strong sense of loss pervades throughout the novel. Moreover, there are times, especially at night, when Shingo is visited by the sound of the mountain, a distant rumble that seems to suggest that his own passing might not be too far away. It was like wind, far away, but with a depth like a rumbling of the earth. Thinking that it might be in himself, a ringing in the ears, Shingo shook his head. Also living with Shingo and Yasuko are their wayward, unsympathetic son, Shuichi and his long-suffering wife, Kikuko, a beautiful, sensitive young woman who represents the main source of brightness in Shingo’s life. In short, she reminds Shingo of Yasuko’s sister, the long-lost love of his youth who died before he decided to get married. Even though he has only been married to Kikuko few years, Shuichi already has a mistress, Kinu, whom he visits after work, frequently leaving Shingo to travel home alone from the Tokyo office where the two men are based. Like Shingo himself, Kikuko also feels rather lonely and isolated in her life. In the absence her husband, she enjoys Shingo’s company, helping him to unwind on his return from the city. That said, there is nothing overtly sexual about Shingo’s relationship with Kikuko; for the most part, it seems more a case of mutual respect coupled with a deep sense of empathy. In other words, their attraction is predominantly spiritual rather than physical. Nevertheless, there are occasions when Shingo’s fondness for his daughter-in-law starts to raise questions in his mind. Yasuko, for her part, is more forthright than Shingo, and she urges her husband to tackle Shuichi head-on over his affair and subsequent neglect of Kikuko. Furthermore, Yasuko believes her husband to be soft, particularly in his favouritism for Shuichi over their other child, Fusako. Shingo, however, has a tendency to procrastinate over familial relationships, preferring instead to avoid any unnecessary conflict. That’s not to say that he doesn’t feel guilty about his lack of intervention here – in fact, he feels it very deeply – but in spite of this, he allows the situation to fester. This same sense of procrastination also characterises Shingo’s relationship with his rather disagreeable daughter, Fusako, who has recently come back to the Ogata family home following the breakdown of her own marriage. Moreover, Fusako has two young children in tow: a petulant toddler who clearly takes after her mother, and a more placid baby who spends most of her time asleep. Once again, guilt-ridden passivity is the order of the day as Shingo opts to let matters run their natural course. Kawabata paints a very nuanced portrait of Shingo here, a man troubled by the tensions and difficulties in the relationships that surround him, especially those in the modern world of post-war Japan. One feels great sympathy for this individual in spite of the inherent flaws and shortcomings in his character – after all, we are all human with our own particular weaknesses and failings. Central to the novel is the question of how much responsibility a parent should take for the happiness of his or her children, particularly where their marriages are concerned. As the consequences of complications in Shuichi’s and Fusako’s respective marriages unfold, Shingo finds himself haunted by a sense of guilt. While he tries to do the right thing, especially for Kikuko and Shuichi, a number of unanswered questions continue to prey on his mind. How many times would Kikuko, now in her early twenties, have to forgive Shuichi before she had lived with him to the ages of Shingo and Yasuko? Would there be no limit to her forgiving? All in all, this is a beautiful, delicate novel laced with a sense of longing for the past, a time when human relations and emotions seemed more straightforward, certainly as far as Shingo is concerned. In several respects, I was reminded of The Gate by Natsume Söseki, a story of urban angst in early 20th-century Japan which I wrote about last year. At first sight, The Sound of the Mountain might seem a relatively uneventful story of an ordinary Japanese family trying to get by from one day to the next. Nevertheless, in reality, there is a lot going on here; we just have to tune in to the author’s rhythm to see it. The book also contains some lovely writing on the natural world. A majestic display of sunflowers in neighbouring gardens; a flock of buntings taking flight; the sight of fresh buds on a Gingko tree – all of these things represent moments of beauty and simplicity in Shingo’s life. 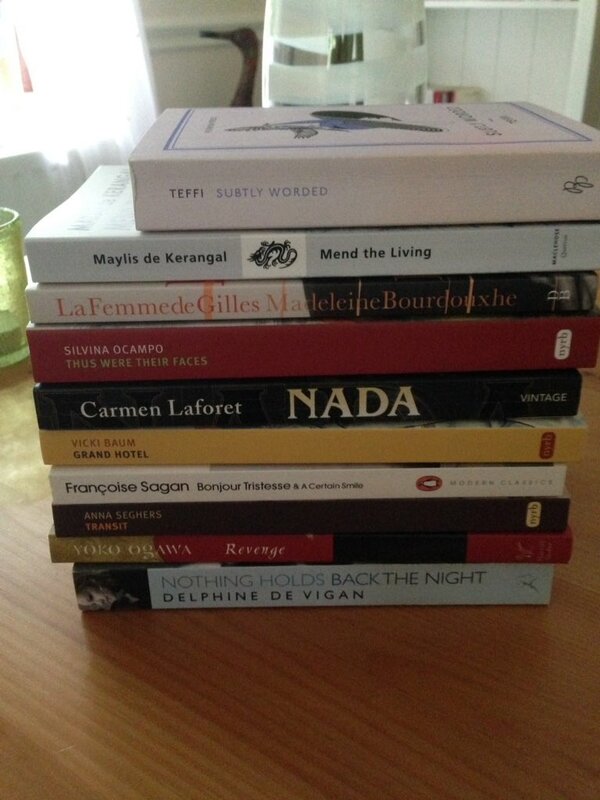 For more reviews of Japanese literature, see Dolce Bellezza’s event which is running to the end of the year. 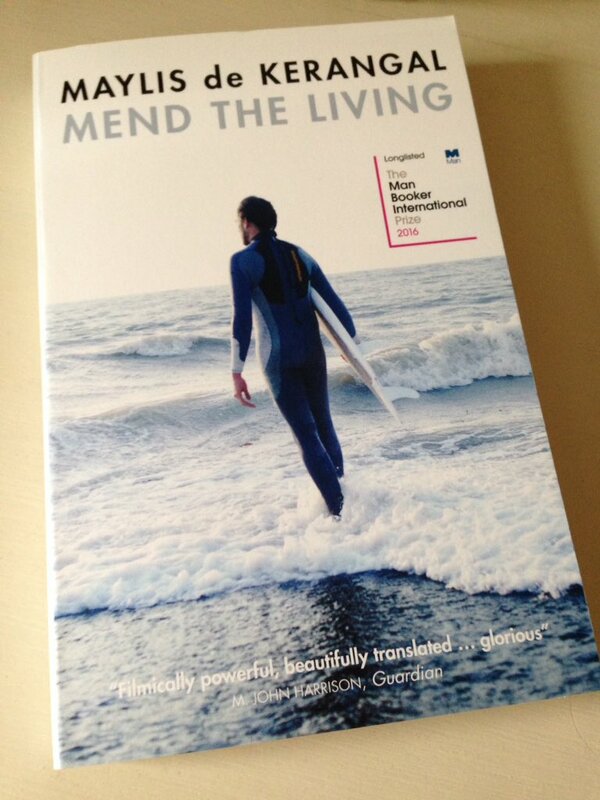 The Sound of the Mountain is published by Penguin Books; personal copy. This entry was posted in Book Reviews, Kawabata Yasunari and tagged #TranslationThurs, Book Review, Classics Club, Edward G. Seidensticker, Fiction, Japan, Literature in Translation, Penguin Books, Penguin Modern Classics, Yasunari Kawabata on October 10, 2017 by JacquiWine. It’s been a while since I last read any Evelyn Waugh (probably more than five years in fact), but the recent appearance in the TV schedules of the BBC adaptation of Decline and Fall prompted me to pick him up again. 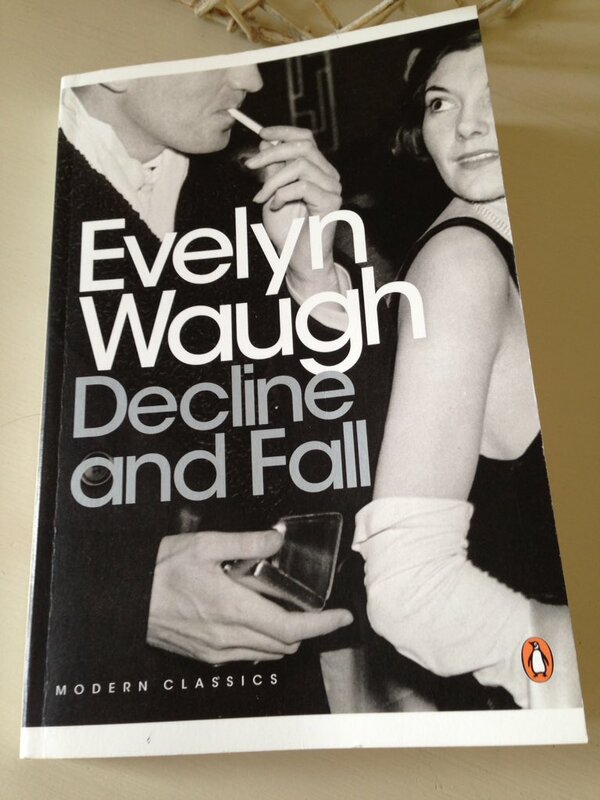 First published in the late 1920s, Decline and Fall was Waugh’s debut novel, a cutting satire which took as its target Britain’s class-conscious society, in particular, the establishment or powers that be and their outrageous codes of behaviour. The novel focuses on a year in the life of Paul Pennyfeather, a rather naive but genial individual who gets caught up in a bizarre sequence of adventures which prove to be his undoing. Through no fault of his own, Pennyfeather is booted out of his college at Oxford for indecent behaviour after being stripped of his trousers by the drunken members of the Bollinger Club (a thinly veiled reference to the University’s notorious Bullingdon Club). A rather unfortunate turn of events given the fact that Pennyfeather, a theology student, was cycling back from a student union meeting at the time, minding his own business as usual. Under the circumstances, Pennyfeather’s guardian decides that he must discontinue his ward’s allowance, thereby leaving our protagonist in the unenviable position of having to find a job. So before long, Pennyfeather finds himself being interviewed for the role of junior schoolmaster at a bottom-of-the-league school in Wales, a position for which he feels totally unqualified. On his arrival at Llanabba, Pennyfeather encounters a strange assortment of oddballs and fools: there is the eccentric head, Dr Fagan, an absurd character who harbours delusions of grandeur regarding the relative standing of his school; then there are Dr Fagan’s daughters, the equally offbeat Flossie, and the briskly efficient Diana (or Dingy as she is fondly known); and last but not least, there are the other masters, a ragtag of misfits who prove to be just as unsuited to their jobs as young Pennyfeather. The standouts here are Prendergast (‘Prendy’ for short), a rather nervous former clergyman who gave up the cloth after being plagued by doubts, and the genial Captain Grimes, an ex-public school man who almost always ends up ‘in the soup’. In this scene, Grimes is giving Pennyfeather the lowdown on his beleaguered colleague. Oddly enough, virtually everyone Pennyfeather meets at the school exhibits a strong desire to open up to him, and so our protagonist gets to hear all their life stories whether he wishes to or not! At first, Pennyfeather is daunted by the prospect of facing a classroom full of unruly boys, but he soon settles into a rhythm, especially once it becomes clear that he is not expected to teach them anything useful or relevant. The main idea is to keep the youngsters quiet. ‘But what am I to teach them?’ said Paul in sudden panic. There are some wonderfully comic scenes in the first half of the novel, most notably those focusing on a landmark event in the school’s calendar, the annual Sports day. At a moment’s notice, Pennyfeather is put in charge of managing the full programme of races and contests, with the hapless Prendergast as referee and Captain Grimes as timekeeper. No expense is spared in preparing the refreshments for the occasion as Dr Fagan is keen to impress the visiting parents and the local dignitaries. Unfortunately, things don’t quite go to plan – not surprising really, especially given the head’s record at hosting these events in the past. To begin with, Prendergast has one too many at the pub before the races get underway, and so he ends up firing the starting pistol into a boy’s foot by mistake. The boy in question, Tangent Circumference, is carried off to the refreshments tent where he is given a large slice of cake to quell his wailing. Then there is a dispute over the result of the six-furlong race when Lady Circumference accuses the winner, Percy Clutterbuck (the son of the owner of a local brewery), of having skipped a lap. Unsurprisingly, the Clutterbucks are far from impressed. As the holidays approach, Pennyfeather receives an invitation from wealthy socialite Margot Beste-Chetwynde (pronounced ‘Beast-Cheating’), mother of one of the more sensible boys at the school. He is to act as a private tutor for a few weeks, coaching her son, Peter, with extra lessons over the Easter break. The glamorous Margot has taken a bit of a shine to Pennyfeather following his exploits at the Sports day – and the schoolmaster, for his part, is also smitten. Little does our protagonist know that his trip to Margot’s residence in Hampshire will lead to even more trouble as once again he finds himself caught up in a scandal through little fault of his own. To say any more would probably give the game away, but suffice it to say that Margot isn’t quite as sweet or innocent as she appears at first sight. I found Decline and Fall an enjoyable satire, albeit somewhat uneven in places, especially in the latter stages of the narrative. While the first half of the novel is tight and packed with viciously comic moments, the second seems more wayward. When the story moves away from the brilliantly-realised settings of Oxford and Llanabba, it loses its way somewhat, becoming sillier and more contrived in the process. Nevertheless, Waugh’s natural sense of comic timing remains impressive throughout. He has a keen ear for dialogue, too, especially in the scenes which are set within the confines of academia. For the most part, Waugh is aiming his sights at the establishment here – the badly-behaved privileged classes, the criminal justice system, even the Press – but there are times when it is hard to feel fully on board with his brand of humour. There are some unfortunate racial slurs here, mostly uttered by rather flawed characters whom we are invited to chastise; nevertheless, they do make for somewhat uncomfortable reading in today’s more enlightened age. By the end of the novel, we come full circle as Pennyfeather returns to Oxford. Renewal is a running theme in the narrative with several of the characters reappearing in new guises at various points, desperately trying to reinvent themselves in the process. As an observer remarks to Pennyfeather in the closing stages of the story, ‘Now you’re a person who was clearly meant to stay in the seats and sit still and if you get bored watch the others.’ He is talking about life here, a messy business at the best of times. Somehow or other, the innocent Pennyfeather was catapulted onto the great revolving wheel of life – imagine it as a wild ride at the fairground – and roundly thrown off again, almost immediately and with a severe bump. Maybe, just maybe, he can find his way back to solid ground. 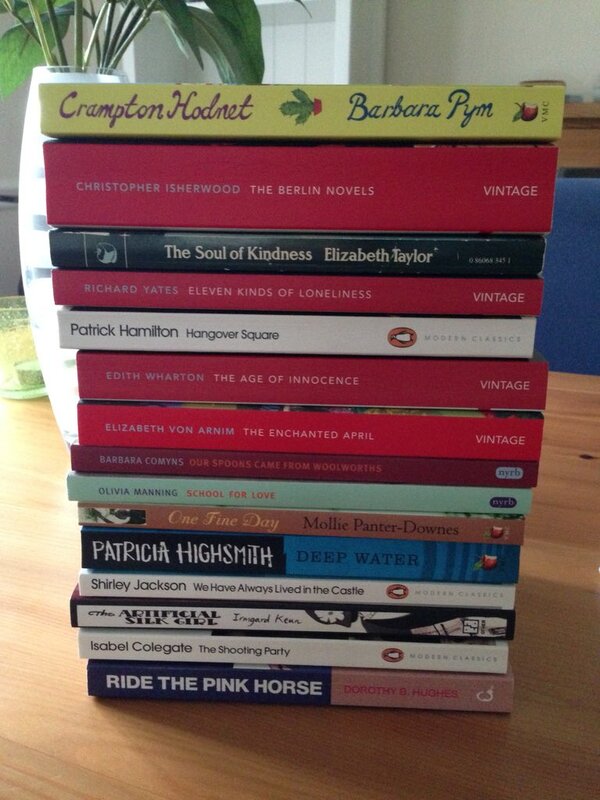 Decline and Fall is published by Penguin Modern Classics; personal copy. This entry was posted in Book Reviews, Waugh Evelyn and tagged Book Review, Classics Club, Evelyn Waugh, Fiction, Penguin Modern Classics, UK on May 16, 2017 by JacquiWine. Oh my goodness, what an enchanting novel this turned out to be! 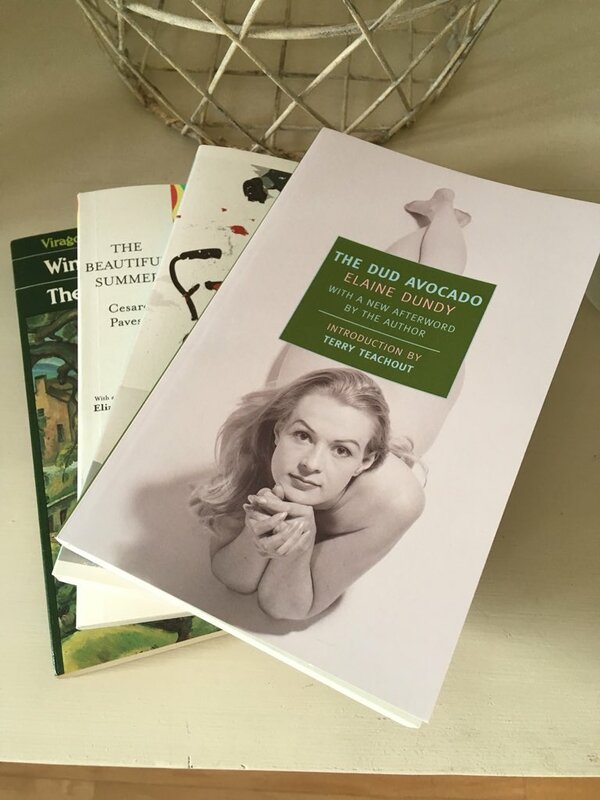 I read it over that beautifully sunny weekend just before Easter, and I couldn’t have chosen a better time – it matched the glorious weather to perfection. First published in 1922, The Enchanted April, tells the story of four very different English women who come together to rent a medieval castle on the Italian Riviera for the month of April. The rather shy and mousey Mrs Wilkins proves to be a somewhat unlikely catalyst for the trip when she sees an advertisement in The Times appealing to those who appreciate ‘wisteria and sunshine’ to take a small castle on the shores of the Mediterranean, furnishings and servants provided – a prospect that captures her imagination on a dark and dreary afternoon in February. Before long Mrs Wilkins is joined in her quest by Mrs Arbuthnot – a woman previously known to her only by sight – who also appears to be transfixed by the very same ad and the idea of a break from her dismal routine. As it turns out, both of these women are unhappy with their current lives, albeit in rather different ways. Lotty Wilkins feels trapped and belittled in a stifling marriage; her husband, Mellersh-Wilkins, is a stuffed shirt and a bully, someone who demands prudence and thrift in every department of their home life except the one that relates to his food. In this respect he is highly critical, dismissing any shortfalls in standards as poor housekeeping on Lotty’s part. Rose Arbuthnot, on the other hand, has all but abandoned any chance of ever being noticed by her husband, Frederick, a highly successful writer of rather salacious memoirs of the mistresses of kings. In the early days of their marriage, the Arbuthnots were very much in love; but all too soon the situation changed as Frederick began to throw himself into his work. As a consequence, Rose has filled her life with other things to occupy her time, mostly self-sacrificing charitable work in support of the poor and needy, primarily as a means of easing her conscience about the somewhat grubby nature of the source of Frederick’s income. In short, Lotty and Rose feel constrained by their respective circumstances, worn down over the years by a lack of love and affection – even though they are only in their early thirties, both of these women seem old before their time. Having overcome their initial reluctance to do something so daring, these two ladies from Hampstead decide they will reply to the ad and take the castle in Italy. The only real obstacle that remains is finding a means of funding the cost of the trip from their respective nest eggs, a task that would prove particularly challenging for Lotty given her personal circumstances. So, as a solution to their dilemma, Lotty and Rose decide to place their own advertisement in the paper in the hope of finding two suitable companions for the trip. Thus they are joined by Lady Caroline Dester, a glamorous young socialite who is seeking refuge from all the charming men who want a piece of her back in London, and Mrs Fisher, a rather crabby old lady who seems determined to live in the past, forever lamenting the loss of old friends and acquaintances from her beloved literary world. On their arrival at the San Salvatore castle, these four very different ladies begin to connect and interact with one another, often with the most amusing consequences. There are some priceless scenes, especially at mealtimes, as the different personalities start to emerge, frequently clashing over the smallest and most telling of details. In this early scene, the elderly Mrs Fisher has adopted the role of grande dame at the breakfast table, almost as if she were the hostess or chief facilitator of the trip. Somewhat unsurprisingly, Rose Arbuthnot is more than a little put out by this development, and so she tries to establish her own standing as joint hostess with Lotty Wilkins, a move which doesn’t quite go according to plan! The indomitable Mrs Fisher is the first to speak here. She turned more markedly than ever to Mrs Arbuthnot. ‘Do let me give you a little more coffee,’ she said. Gradually over time, the castle begins to work its magic on the occupants, often in profound and surprising ways. Lotty Wilkins is the first to experience its bewitching effects, transformed as she is by the abundance of beauty and resplendent atmosphere at San Salvatore (the descriptions of the gardens are magnificently lush). And how could she fail to be when she opens her curtains for the first time in the morning, only to be greeted by the following sight? Almost immediately upon her arrival at the retreat, Lotty Wilkins comes right out of her shell, becoming bolder, more impetuous, more enthusiastic about life and all the possibilities it has to offer. As a consequence, she makes an audacious decision, one that she hopes will lead to the promise of greater happiness in the future. To reveal any more might spoil things for the reader. Suffice it to say that Lotty’s enthusiasm is infectious, so much so that it catches the attention of the previously reclusive Lady Caroline. As a consequence, these two women strike up an unlikely friendship, one that looks all set to last beyond the duration of the trip. Lady Caroline, for her part, also begins to question the value of her life to date and what may lie ahead for her in the months and years to come. Even the disagreeable Mrs Fisher starts to soften as she realises that the members of the younger generation are not all as shallow and as frivolous as she had previously assumed. Nevertheless, perhaps the one person who is most affected by Lotty’s optimism and enthusiasm is Rose Arbuthnot. As she reflects on the transformation in her new friend, the rather lonely and sensitive Rose longs to experience something similar. If only her life with Frederick were different, if only they could recapture the early days of their marriage, the first flushes of love and affection for one another, the feeling of being cared for and valued by an attentive partner. Without wishing to give away too much about the ending, this utterly charming novel has a touch of the fairy tale about it as the lives of these four women are altered in various ways by their time at San Salvatore. At times, I was reminded of Winifred Watson’s equally adorable book, Miss Pettigrew Lives for a Day, a story that also captures a sense of joie de vivre and escapism from the constraints of an unfulfilled life. Von Armin takes great care in portraying each of her central characters with enough subtlety and depth, thereby encouraging the reader to invest in these women from an early stage in the story. Lotty Wilkins and Rose Arbuthnot are particularly well developed, especially in the fleshing out of their marriages and the different challenges they face with their respective husbands. Lady Caroline is also painted in a nuanced fashion. At first, it would be tempting to assume that she is simply selfish, spoilt and rather ungrateful for the attention others lavish upon her; but as the novel progresses, a different side to her personality starts to emerge, one that is more thoughtful and vulnerable. Even the fusty Mrs Fisher is portrayed in a manner which ultimately encourages the reader’s sympathies as it becomes clear that she too is rather lonely and isolated in her restricted life. All in all, this is a most delightful novel with much to commend it – another strong contender for my end-of-year list. 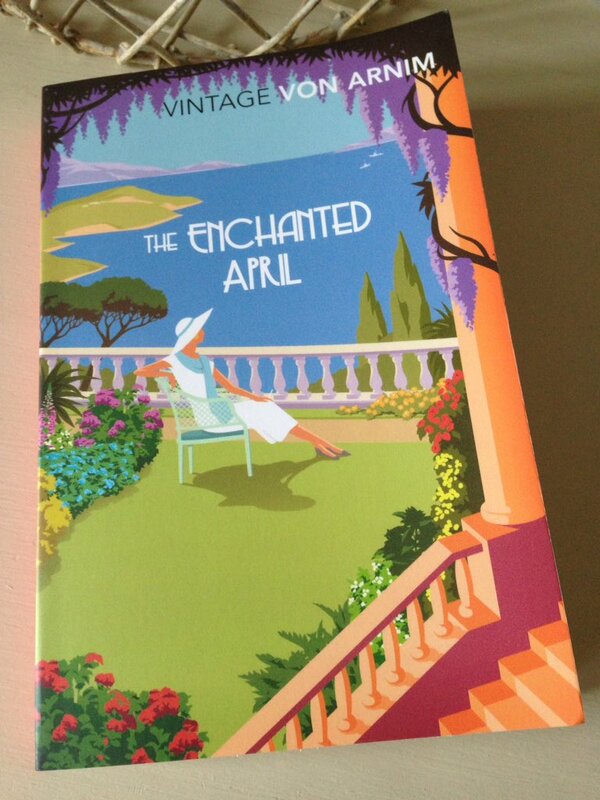 The Enchanted April is published by Penguin Classics and Vintage Books. 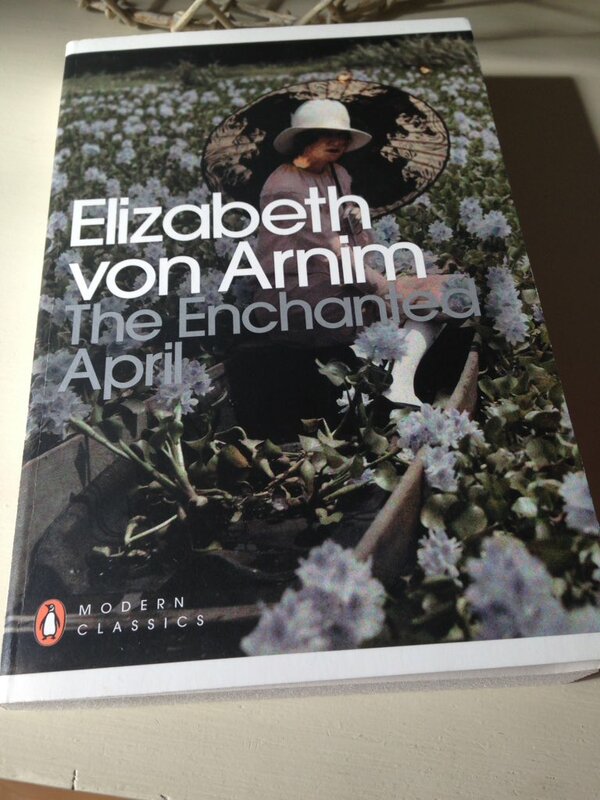 This entry was posted in Book Reviews, von Arnim Elizabeth and tagged #ReadWomen, Book Review, Classics Club, Elizabeth von Arnim, Fiction, Penguin Modern Classics, UK, Vintage Books on April 18, 2017 by JacquiWine.